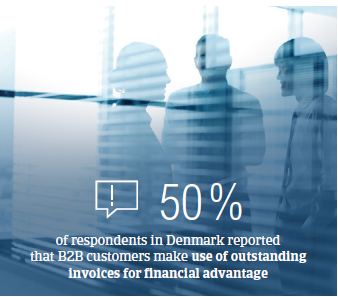 Half of our Danish respondents (27% in Western Europe) said that B2B customers delay payments as they use outstanding invoices as a form of financing. With an average of 69% of B2B sales made on credit, Denmark is the country most prone to making use of trade credit in B2B transactions (Average for Western Europe: 41%). Over the past year, the share of credit based sales has seen a small increase of 2 percentage points. 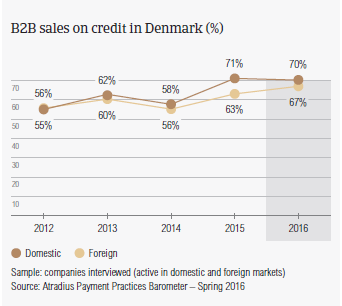 This year, Danish respondents showed no strong preference for selling on credit to either domestic or foreign B2B customers. More specifically, 70% and 67% of the total value of domestic and foreign B2B sales respectively were made on credit (survey averages: 45% domestic and 38% foreign). The share of foreign sales made on credit terms increased almost 4% over the past year, highlighting the country’s trade credit-friendly stance towards foreign customers. 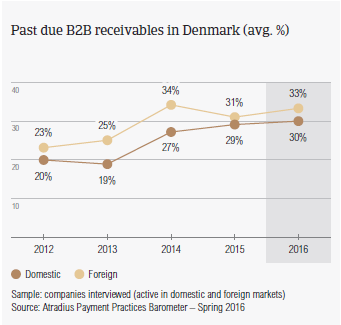 Around 63% of respondents in Denmark experienced late payment of invoices by B2B customers in 2015. This is well below the average of Western Europe overall (79%) and indicates the relatively good payment morale in the Danish business culture resulting in reduced risks of default. At the same time, fewer B2B receivables remained outstanding past the due date in Denmark (31%) than in Western Europe (39%). Late payment seems to occur more often with domestic customers than with those abroad. Late payment of invoices (domestic and foreign) is reflected in the Days Sales Outstanding (DSO) figure posted by Danish respondents. This averages 32 days, and is the lowest among the countries surveyed. Moreover, it is 16 days below the survey average and three days shorter than the DSO figure in 2015. This reflects Denmark’s greater efficiency in collecting high value long outstanding invoices. Over 80% of respondents in Denmark expect no change in the DSO figure over the coming 12 months. When asked about the main challenges to business profitability in 2016, more Danish respondents (27%) than Western European ones are concerned about a fall in demand for their products and services. Cost containment, however, does appear to concern Danish respondents (20%) less than those in Western Europe (23%). Customers of Danish respondents are given an average of 24 days from the invoice date to settle their payments. This is one week shorter than the survey average, once more underlining the emphasis on swift payment. There is a difference of only three days between domestic and foreign terms, reflecting a uniform perception of payment risk arising from B2B trade. Compared to 2015 levels, the average payment term in Denmark increased by only two days. 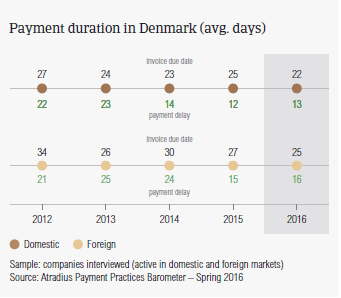 Compared to respondents in Western Europe (average of 21 days), customers of Danish respondents settle their payments much faster, on average within 14 days past due date. This means businesses in Denmark collect payments from their B2B customers around 38 days after the invoice date, being able to turn past due receivables into cash much faster than respondents in Western Europe overall (53 days). The majority of respondents in Denmark (49%), compared to 27% in Western Europe, reported that their B2B customers mainly delayed their payments because they use outstanding invoices as a form of financing. Just like in 2015 (48.5%), this is the highest percentage of respondents citing this delay factor of all the countries surveyed in Western Europe. Danish respondents also believe that domestic B2B customers (51%) are delaying payment for this reason more often than foreign ones (47%). More Danish respondents (27% domestic and 35% foreign) than respondents in Western Europe overall (17% domestic and 28% foreign) believe that payments are delayed because of the complexity of the payment procedure. The averages posted by Danish respondents suggest a growing concern in the country’s business environment. About 60% of respondents in Denmark believe that payment delays did not impact their businesses significantly. This shows a strong grip on managing accounts receivables. However, 17% of respondents said that due to payment delays they needed to postpone payments to suppliers and another 17% believe that payment delays have caused them to lose revenues. In order to improve credit management in 2016, 29% of Danish respondents said that they will check their buyers’ creditworthiness and 25% that they will check their customers’ payment records more often. 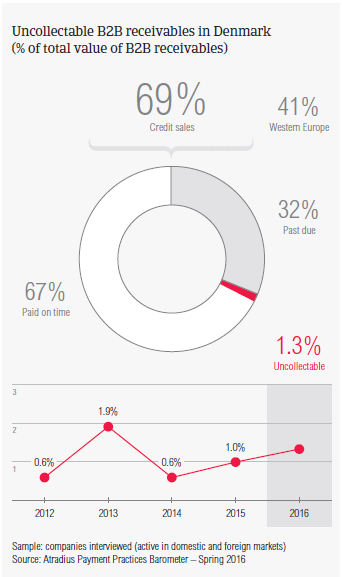 Danish respondents reported that 1.3% of their B2B receivables was uncollectable. This is an increase from the 2015 level of 1% and is now consistent with the average for Western Europe (1.3%). Uncollectable domestic receivables were written off almost as often as foreign ones. Uncollectable B2B receivables originate most often from the construction, consumer durables and business services sectors. The majority of respondents in Denmark (66%) compared to 59% in Western Europe (59.3%) said that their B2B receivables were uncollectable because the customer went bankrupt or out of business. According to 27% of Danish respondents, B2B receivables were also uncollectable because of the high cost of pursuing debtors. This percentage is in line with that of Western Europe (26%). Survey respondents in Denmark reported granting trade credit terms mainly to B2B customers belonging to the business services, construction, and consumer durables sectors. Invoice payment terms extended to B2B customers belonging to these industries are consistent with the country average of 24 days. Customers in the business services industry are the slowest payers with a payment delay reaching 75 days. 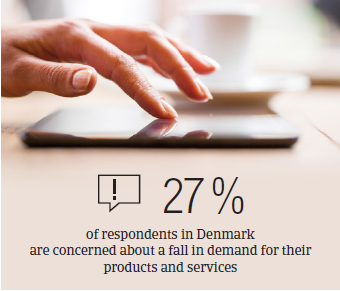 Around 50% of survey respondents in Denmark said that payment delays are most likely to occur due to buyers’ use of outstanding invoices for their financial advantages. 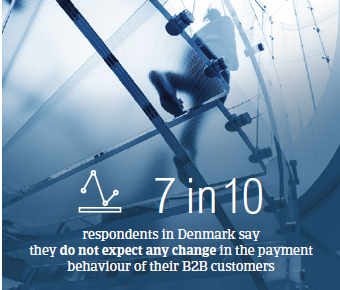 Almost 70% of Danish respondents said that they do not expect to see any changes in the payment behaviour of their B2B customers over the coming 12 months. At the same time, around 20% of respondents expect a slight deterioration. Natural gas prices have fallen significantly in Asia and Europe on the back of the sliding oil price. As more LNG comes on the market regional prices are set to remain low.